I don’t like to lie to my kids, and I rarely if ever do. So, when we grabbed a taxi cab during a trip to Florida and had to ask Princess Two to “pretend” to be five-years-old, when she was only four, we were in that gray area. A very gray area that she couldn’t quite understand, and nearly lost us the taxi cab ride. Apparently in Florida, and many other states, car seat laws have changed for taxis, they’re now required for children under the age of five to ride in child safety seats. I think this is GREAT…if you’re traveling with a car seat or if the driver has one with them. This was not the case for us, at least not on this trip since we were going on a cruise and literally would only need it for the ride to and from the airport. Enter RideSafer, a portable travel alternative to car seats and high back boosters. 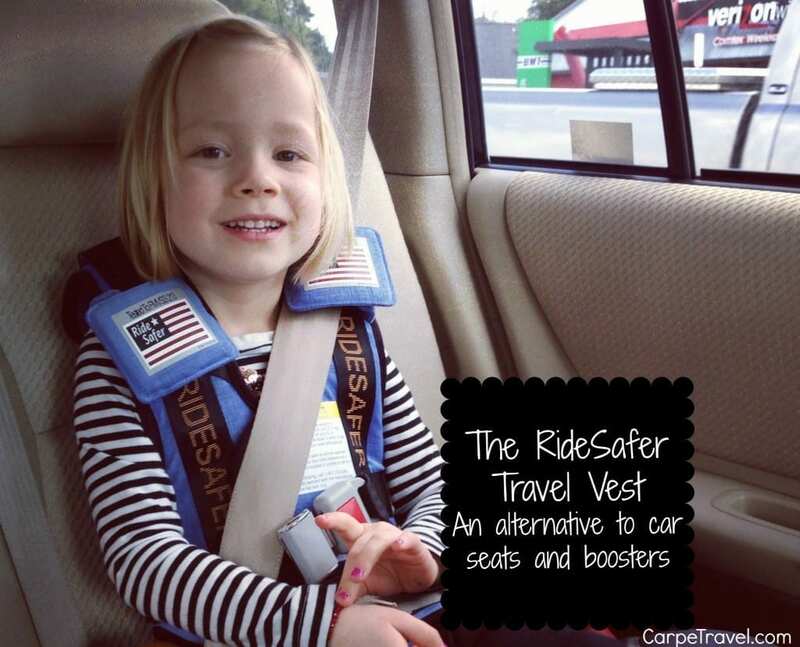 The RideSafer is an alternative to car seats and high back boosters. Since I despise traveling with car seats, this portable alternative seemed like a necessary product to have for our future travels. The RideSafer travel vest is a legal alternative and meets Federal Motor Vehicle Safety Standard. It’s important to note the vest was designed for children 3 years old and up who can sit forward facing. There are two sizes for the vest – a small fits children 34″ to 52″ tall, 30 to 60 lbs. and the large fits children 45″ to 57″ tall, 50 to 80 lbs. While there are two size for the vest, they will both grow with your child as the straps are all adjustable. 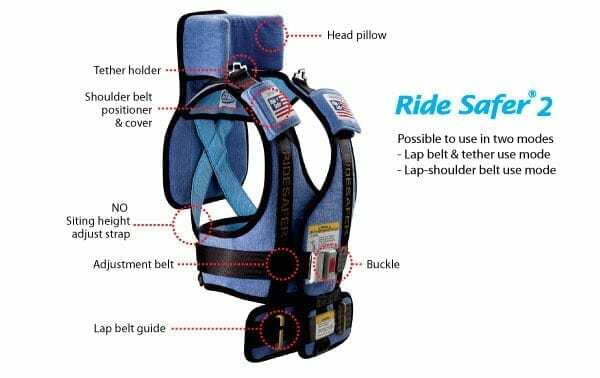 RideSafer travel vest includes tethers, which are metal hooks above the shoulders that are then connected to the built-in safety tethers in cars. I have to admit, I feel a bit safer using the tethers than what a typical booster seat provides. Both models allow for a crotch strap to be added. This is not required for use as long as the child is mature enough to sit upright during the entire trip. The RideSafer travel vest comes with a removable head rest. I found this option to be great for nap-time in the car and with younger kids, I can see the comfort value in using this on a more regular basis. Using the RideSafer is a great way to create more space for additional passengers. Both my girls and I could comfortably sit in the back seat on since we could rid the car of the bulky booster seats and car seats. We haven’t taken our kids on on train rides just yet, but this travel vest will come in very handy when we do. It can be used in planes and trains and automobiles. Simple enough a kid can do it (with a few lessons). My girls are pretty independent and like to do things for themselves. When it comes to buckling up, they own the task. With a few lessons they were pros. It is a little difficult for younger kids to buckle up though since inserting the safety belt straps requires fine motor skills. An added perk to the RideSafer travel vest is that they’re reusable. Car seats age with use, making them less safe. In other words, you can’t always use hand-me-down car seats. This is not the case with the RideSafer. Overall, this is a great product to use at home and when you’re traveling. We’ve already removed the booster seat from the car for Princess One and use it exclusively at home now. Easy to grab and go before we jump on the plane. I highly recommend the RideSafer. Here is a quick video to show you just how easy it is to use (thanks to Princess One for helping demonstrate). Have you used the RideSafer before? What was your experience with it? RideSafer provided one travel vest for this review. After reviewing it, I purchased a second. They are that good. I think my spacial thinking would be seriously challenged. What a great concept! I’m sure the portability comes in handy (its been awhile since I’ve had to worry about that) and this is a really neat idea! Oh my. All those instructions, I think it might be easier to not have kids! (just kidding) Maybe one day I’ll be a pro at this. I have to admit, this is way easier to do than installing a car seat. I break a sweat each time I have to do that. No doubt kids love this Elaine. Great idea. This sounds like an amazing product! I loathe traveling with car seats, too, so this seems like something I need to check out! Thanks for this review! Nice. Will buy one for my baby. I had no idea products like this were available for cars! My daughter is to young, but good to know! I wish I had known about it much earlier. They’re so much easier to travel with! 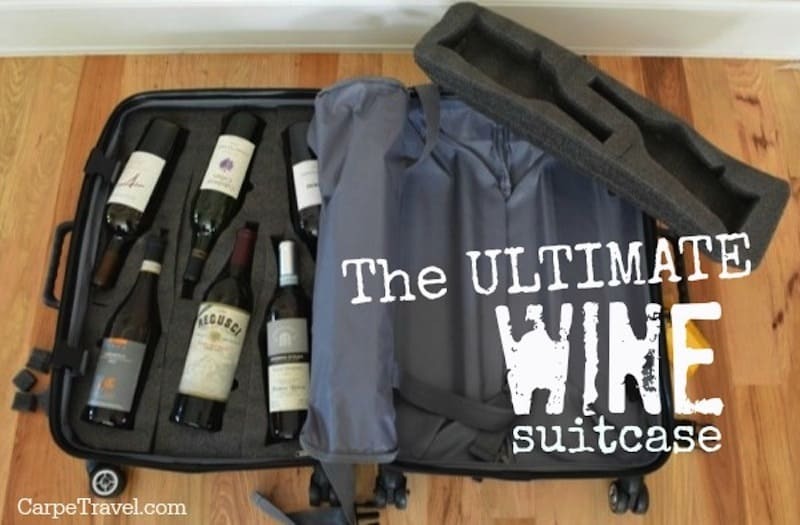 Looks great for travelling – less lugging around! Yes, it’s soooo much easier to travel with. You can just slip it into your bag or child’s backpack. Why is it that all the cool stuff comes out after you need it? That looks like something that would be so useful for a traveling family. We’ve been using these for travel for five years. About a year or so we upgraded to the bigger kid version. These are great when traveling domestic or international but I can’t imagine using this every day. It’s simply not as safe as a five point booster (which my 8.5yo) still uses as his main seat. But it’s great for bringing along an extra kid or when my son is the extra one as it can fit in the middle seat as long as there is a shoulder harness. Also in the list of cons, it’s time consuming to thread in the seat belt into three places every single trip, there are no cup holders or headrests, there is no “boost” to see out of windows, and it’s tedious to get in and out of if there are a lot of errands and such. But it’s awesome for when we’re flying and traveling light.